On 11 September 2015, over 2.3 million Singaporeans went to the polls to elect their 13th Parliament, the very first time since Independence that all Parliamentary seats were being contested giving all eligible voters the opportunity to elect their representative at what has turned out to be a truly watershed election. MARUAH would like to invite you to a forum, which will be led by a group of experts who will talk to us on General Elections 2015 and what it means for our democracy and parliamentary development. The panel discussion will be moderated by MARUAH. 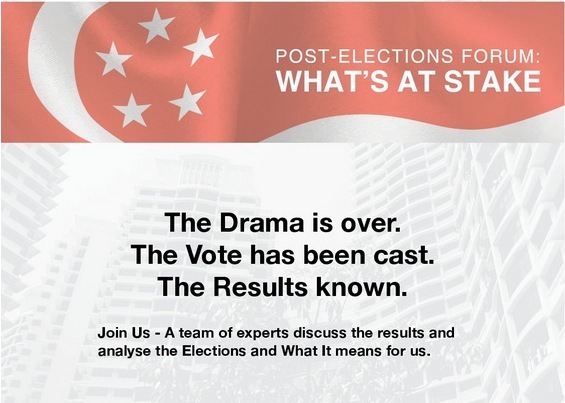 We are also hoping for an interactive debate on the issue of General Elections in Singapore and would like to make some key recommendations. Please sign up via this link by Friday 18 September 2015. 1) Will there be time allotted for those who buy the books to have them autographed by you? 2) Would there be a Q and A session after the talk? 1) Hi Mohan, yes, I will be there early at 2pm, so I can certainly autograph your book. Let me know which one you want, I’ll make sure they’re available. Hi Sudhir, I’m afraid I may not be able to make it as my earlier event might end later than expected. Will definitely try to come by if I can. Hope the forum goes smoothly.